Where $15 Is Only Worth $12 │ U.S.A │ By City Lab – @Informal Blog for professionals Facility Management. U.S.A. Info by City Lab : Like some miraculously bipartisan presidential hopeful, the $15 minimum wage is on a hugely popular, non-stop tour of America. Earlier this month, New York state announced a long-anticipated plan to phase in a $15 minimum wage for fast-food workers, whose 2012 protests sparked a national movement. That move is hot on the heels of Los Angeles County’s recent decision to raise county wages to $15 by 2020, matching L.A. City Council’s decision in June. Seattle and San Francisco have adopted $15 plans. Plenty of other major cities in the U.S. are talking about it. Both $12 and $15 minimums have been proposed by members of Congress, too. By traditional standards, however, these new figures represent very big wage hikes, and economists don’t agree on how positive their outcomes would be. A $15 minimum wage might help some families escape poverty. It could also increase the likelihood that others actually fall into poverty, as a result of job cuts. Only in Allentown, Pennsylvania, will $15 buy you $15 worth of stuff. Certainly, the real value of a ramped-up minimum wage would look very different around the country, due to wide discrepancies in local living costs. 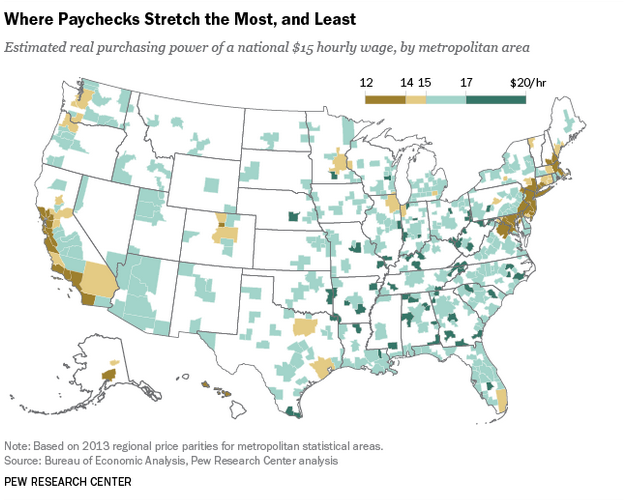 As a new map from Pew reminds us, wages tend to stretch further in metro areas in the Midwest and South, and to contract on the coasts. That $15-per-hour paycheck won>’t get fast-food workers in New York City nearly as far as it would get them in Macon, Georgia. To calculate the relative purchasing power of a $15 federal minimum wage, Pew used data on “regional price parities,” or RPPs, for 381 metropolitan statistical areas. RPPs “measure the difference in local price levels of goods and services across the country, relative to the overall national price level (set equal to 100),” according to Pew.